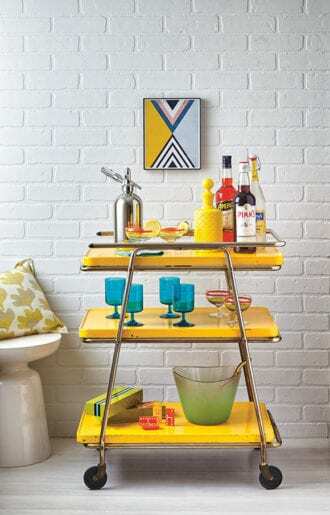 “The concept of a bar cart is essentially a ‘satellite’ bar allowing you to make a drink or two in another room without having to walk back and forth to the bar,” says Conway. “Whatever you reach for most, or you are eager to serve guests when they come over, should be front and center on display.” One way to start stocking is by thinking about the spirits and mixers needed to make one or two cocktails. If your go-to is a Manhattan or Old Fashioned, stock a rye whiskey, a bourbon and a sweet vermouth, plus some bitters, a jar of cocktail cherries and a bowl of oranges. Or allow guests to mix their preferred Martini with a gin, a vodka and a dry vermouth, with olives and lemon twists on the side with cocktail picks. For basic tools, you’ll need a jigger, shaker, hawthorne stainer, mixing glass, barspoon, julep strainer and citrus peeler. “I store these propped up in a pretty glass or cup on the cart,” says Conway. “It’s tempting to shove every single bottle, shaker and glass onto the cart, but it will just come across as cluttered and haphazard,” Conway says. “The bar cart should be reserved for displaying your crème de la crème of spirits and vintage glassware.” This means most of your home bar collection can live in cupboards, the pantry, or, in the case of mixers or opened bottles like vermouth, the fridge. For items that do go on the cart, whether long-term decoration or just-for-the-night ingredients, one of Conway’s preferred methods of organization is a simple serving tray. “Trays are key for corralling your bar items on the cart to make them appear purposefully placed,” she says. 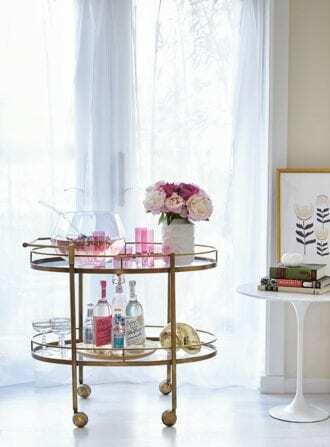 Trays are easy to move, they’re affordable and they come in a variety of styles, making a bar cart even more versatile. The Belgium native has helped make the brewery one of Georgia’s best.